Last week, my family and I had a staycation and it was one of the best vacations I've ever had. Being a busy working mom, it's sometimes difficult to find time to explore local sites. Some places are even extremely busy on weekends. This time off helped my family experience what our own area has to offer without a lot of hassle or fuss. And what's not to love about a staycation? You don't have to pack any bags. You save money on hotel rooms. You reduce carbon emissions and save gas by not driving or flying long distances. What did we do on our staycation? We went to a few farms that we've never visited before, kayaked on a nearby lake, took a brunch cruise on that same lake, attended a county fair, spent time with family and friends and generally relaxed and enjoyed each other's company. Everything we did was relatively a new experience for us and all within a 10 mile radius from our home. One exception was that spent time with friends at a peach festival which was 40 miles away. With a little research, preparation and open-mindedness, you can have a great staycation. Here are 16 ideas to make your time off enjoyable. Do one or more activities on this list...or make up your own! This website has a list of sites by state then by city. You might be surprised at what historical sites are near you. 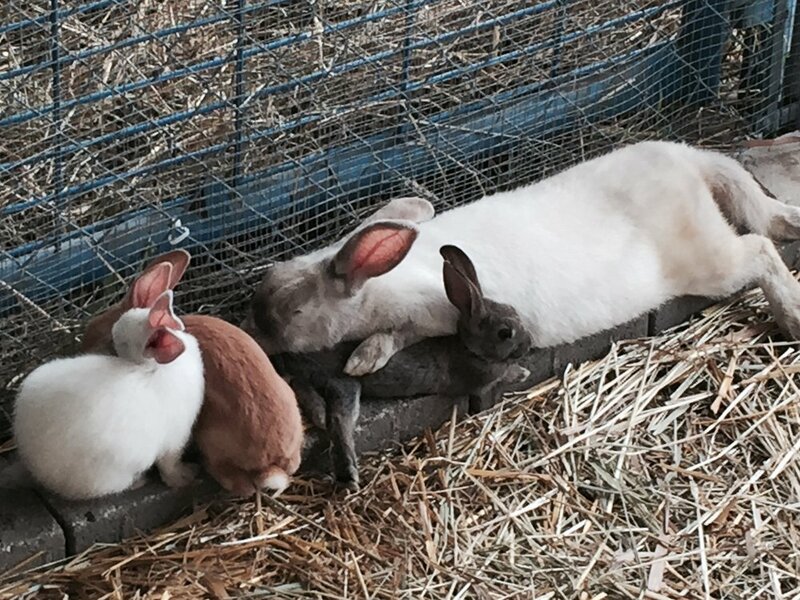 Bunnies at the county fair. Check to see if there are county fairs, festivals, conventions or other events. Take a fun class or attend a lecture. You can learn anything like photography, golf, floral design, photoshop, sailing, dancing or even astronomy. Find something that interests or inspires you! Does your busy life prevent you from spending time on hobbies that you love? Our family loves kayaking. Make time during your staycation. Spend time outside. Go on a hike. You can find national parks by state on the National Park Service website. I like to look at Groupon or Living Social for ideas. I've seen deals for race car driving, wine & painting nights, rock climbing. My sister was able to use a living social coupon for her sensory deprivation/floatation therapy! Dine at a famous local restaurant or make it a point to eat your favorite food. Remember, it's your vacation! Hang out at your favorite coffee shop or grab a drink at a bar. The smell of these peaches at a local farm was incredible! Enjoy a performance at your local theater. Curl up with a good book. You can get recommendations on Good Reads. Be with the people you love. Play with your kids. Plan a lunch with your family member or friend while they are at work. It's all about quality time. Meet others with similar interests near you using the MeetUp website. Feel good by doing something good! You can help people, animals or even clean up a local lake. Volunteer Match helps recommend volunteer opportunities based on location and interests. PJ's all day! Binge watch a new TV show! Sometimes the best plans are no plans at all! Get out and see what around your area! Do you live near a farm...a lake...a zoo? Google local attractions near you and check them out! A staycation is a perfect time to spend time with family and friends, explore your area, have new experiences or do what you love. We would love to hear some of your staycation ideas. Let us know in the comments below. Happy staycation-ing!